Adam Rawson, YBF winning chef formerly at Pachamana, White Rabbit, and Lucky Chip, is back with a new pop-up, again taking inspiration from a recent trip to Spain. 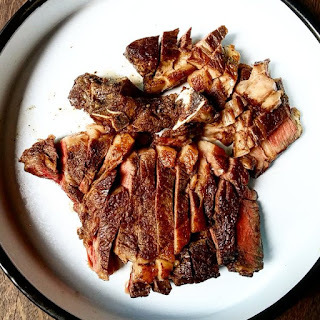 While last month's pop-up at The Newman Arms was inspired by lots of dishes he had in San Sebastian, this one is inspired by the "Casa Julian" steakhouse of Tolasa, Basque Country. Taking place on Sundays 20th & 27th March, tickets are just £50 each, and for that you will be treated to a full menu, including a 1kg aged Basque rib eye for two. Sounds incredible! "Continuing with my Basque country adventure I'm really happy to be partnering up with OneSixty Smokehouse and Bar to present you "Casa Julian" of Tolasa, Basque Country. Julian Rivas opened the restaurant in 1951, then after years of running he decided to retire and nominated Matias Garrotxategui to take over, and now his son Xabi is on the grills to continue the next generation of mind blowing steaks! This place was so amazing that we booked another table as soon as we finished our last bite! And was just as good the second time round!! The restaurant has such a warm feel and a family welcome! So I really wanted to do something here in London as a thank you for making us feel so welcome! I've taken they're menu and put a little twist on it (as usual).. I'm sourcing the same meat as them through my close friend Nemenja who owns restaurants Lurra & Donostia in Marble Arch. I have a weekly newsletter featuring news about all of the latest and best pop-up and temporary things in London. Please sign up below!